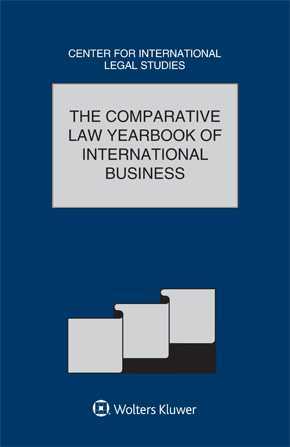 The Comparative Law Yearbook of International Business, published under the auspices of the Center for International Legal Studies, covers the up-to-date developments in the legal areas of product liability, cybercrime, corporate and contract laws, and digital rights. In this thirty-ninth volume, practitioners and experts analyse the landmark decisions that have inflicted a remarkable effect on the legal situation in the key jurisdictions of Belgium, Canada, Germany, the Isle of Man, Japan, New Zealand, Romania, South Africa, and the United States. copyright protection of digital rights management. As a scrutiny of the updated developments in the legal fields, this yearbook helps readers gain insight into national and regional perspectives on the interpretation of laws relating to diverse fields. The presentation of the case reports aids in understanding the impact of such legal developments in practice. Thus, this book serves as a source of knowledge for lawyers and academics to comprehend the changing legal rules and regulations and to confidently apply them to solve problems.